Below-knee amputation or lower–knee amputation is a surgical process conducted to remove a limb damaged due to any injury, trauma or disease. The process of amputation can be performed at any age, but is more prevalent among the age group of 65 years and older. What do we mean by Below-Knee Amputation? Below-Knee Amputation or BKA is a surgical process to remove the damaged or diseased limb. The main reason behind BKA (Below-Knee Amputation) is peripheral vascular disease or poor circulation in the lower limb. Due to poor circulation; immune or healing responses to injury limit and foot or leg ulcers may form that do not heal. These damaging ulcers may develop infection spreading to bones. Amputation is conducted to remove these diseased tissues and to prevent further infection. During BKA, an orthopedic or vascular surgeon removes the diseased limb while saving as much of healthy bone and tissue as possible. The remaining limb is then shaped up, so that it can be used for a prosthetic leg. Below-knee Amputation is a very difficult and challenging phase, both emotionally and physically. More energy and strength is required to walk with a prosthesis than normal walking. Your physical therapist can develop an individualized exercising regime which will not only increase your overall strength, range of motion and flexibility, but will also expedite your recovery and reduce time between amputation and first step with a prosthesis. Educating to move about in a wheel chair and to walk and stand with a supportive device. Maintain normal range of motion through stretching and positioning exercises. Making you wear elastic Shrinker sock. This also helps to shape the limb in order to prepare it to fit it in prosthetic leg. Your physical therapist will monitor the fit of these devices and as well educate you to use them properly. TENS and electrical stimulation may be used where pain is relieved by blocking nerve signals. Manual therapy; involving joint manipulation and massages may be used to improvise circulation and joint motion. Stump management is instructed which includes skin care and stump sock use. Your physical therepist will help you to master using wheel chair and walking with a supportive device like cruthes or walker. Therapist will educate you about using your prosthetic limb successfully and will also make you learn how to take care of your resideual limb with regular skin and hygiene checks, exercising and correct positioning. Therapist will also educate you how to put new prosthesis and take it off. Therapist will also help you to build up tolerance for wearing your prosthetics for longer times while protecting skin intergrity of residual limb. Prosthetic training takes time and physical therapist make you learn to stand, balnce and walk with a prosthetic limb. You may progress gradually and eventually learn to walk independently, without using any supportive device. Your therapist will also continue with stretching and strengthening exercises unless you achieve your fullest potential and become able to perform the activities you used to before amputation. Contact Alliance Physical Therapy for thorough and agile post below knee amputation rehabilitation. Our professional physical threrapists are experienced at treating patients with amputation conditions. Our dedicated therapists have advance knowledge and are experienced at providing prosthetic training. Piriformis muscle is a flat and band like muscle that is located in buttocks near the top of the hip joint. This muscle helps in the movement of the lower body as it makes the hip joint stable and as well lifts and rotates the thigh. What do we mean by Piriformis Syndrome? Piriformis Syndrome is an uncommon neuromuscular pathology which occurs when the sciatic nerve is compressed by the piriformis muscle. This compression causes pain, tingling and numbness in the buttocks and along the sciatic nerve path going down the thigh into the leg. What are the potential signs and symptoms of Piriformis Syndrome? What are causes of Piriformis Syndrome? What are the Physical Therapy treatments suggested to cure Piriformis Syndrome? Stretching exercises are prescribed to relieve sciatic nerve irritation. Heat treatment is suggested to relax the piriformis muscle. Ultrasound treatment is advised for the deep heating in buttock area. Hands-on treatment like deep-tissue massage or soft-tissue mobilization is administered to relax nerve signals to the piriformis. Strengthening of abductors and abductor muscles may be suggested. Myofascial release and thrust techniques may be suggested to address the somatic dysfunction in the patients. Osteopathic manipulative treatment (OMT) may be advised to restore patients’ normal range of motion. Pelvic and spine re-alignment techniques are suggested. Foot orthotics or exercises are advised to restore foot and lower extremity alignment. Contact Alliance Physical Therapy for the state-of-art and efficient treatment of any of your neuromusculoskeletal problems or deformities. We use patient proven methods and techniques to get you back to your daily routine as soon as possible and make you as sturdy and healthy as before. What do you understand by Foot Drop? Foot Drop, also referred to as ‘drop foot’ is a gait abnormality, where person is unable to lift his/her forefoot and hence walking becomes challenging for such persons. Foot drop is not a disease in itself but rather a sign of underlying foot disorder that can be neurological, muscular or anatomical. Foot Drop can affect one or both the feet and as well be temporary or permanent depending upon its cause. Under this condition, patient loses partial or total control over the foot. The toes of such patients either point towards floor when they lift up the foot from the ground or they tend to drag the foot along the ground while walking. What conditions give rise to Foot Drop? What are the signs and symptoms of Foot Drop? What are the physical therapy interventions employed to treat Foot Drop? Strengthening exercises are practised to strengthen and stretch foot and to mobilize the ankle. Treatment regime including electrical stimulations of nerve and muscle fibres’ may be advised to enhance the tone and contractility. Home program including; strengthening, stretching and stabilization exercises and instructions is designed to help patients to perform daily tasks. Contact Alliance Physical Therapy for the efficient treatment of your neurological and muscular disorders. Our dedicated and diligent physical therapist will help you walk the road to recovery. How to Avoid Back Pain during Gardening Season? Warming up of weather and occasional glimpses of yellow orb in the sky excites most of us to get out in our gardens and make preparations for the spring time. Gardening is an excellent and vigorous outdoor and therapeutic activity but it also sends many of us to the doctors and physical therapists. 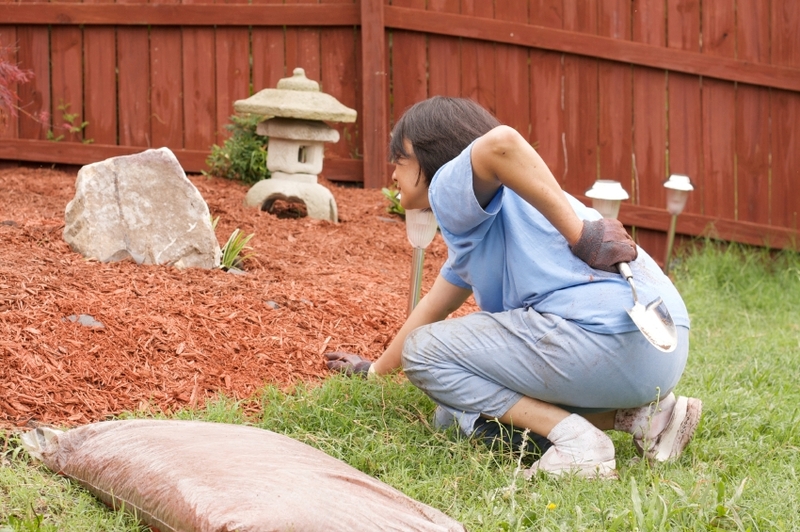 Back Pain is the most common symptom among the people with gardening habits. Warm up with light movements and go for a brisk walk to increase your flexibility. Do not bend repeatedly. Try to do your work by kneeling or sitting. Lift the gardening tools and equipments carefully. Instead of putting pressure on your back and hips, let your arms, leg and thighs carry the load by bending properly at your knees. Make use of long-handled tools for proper grip and to eliminate back strain. Practice proper and good body mechanics i.e. do not work in the similar position or posture for long time. Keep your back in the proper alignment to reduce unnecessary strain. Use stools and upside down buckets to sit comfortably and use pad to kneel to avoid knee pain. Take frequent breaks, Stand up and walk around in-between the gardening activities. Never bend and twist your back at the same time. Stand up like you are getting out of the chair, i.e. keeping your back straight. If you feel pain in certain area, apply ice or cold pack to the affected area and do not resume the activity till the pain subsides. Concentrate on your legs and core while lifting heavy bags of soil, digging with a shovel and carrying water hoses. What are Symptoms, Causes and Treatment available to treat Hip Bursitis? Hip Trochanteric Bursitis is one of the most common reasons of hip pain. This condition affects both the active and inactive individuals but the condition is more common among the middle-aged women or females. What do we mean by Hip Trochanteric Bursitis? Hip Trochanteric Bursitis occurs when the bursa that covers the bony point of hip bone (greater trochanter) becomes irritated or inflamed. This is the most commonly inflamed bursa of the hip joint. What are the causes of Hip Trochanteric Bursitis? Repetitive stress-injuries resulting from running, bicycling or standing for long hours. What are potential symptoms of Hip Trochanteric Bursitis? How can Physical Therapy help to treat Hip Trochanteric Bursitis? Electrotherapy or deep-tissue massage technique may be used to reduce pain & irritation. In order to decrease muscular tension, stretching techniques may be applied to the lower body. Strengthening exercises may be applied to eliminate excessive strain at the trochanter. Contact Alliance Physical Therapy for the state-of-art and efficient treatment of any of your musculoskeletal problems or diseases. Our professional and diligent Physical Therapists use patient-proven methods and top-notch techniques to treat your problems and help you to get back to your work as early as possible. Hand Health Resources considers Cubital Tunnel Syndrome as the second most common nerve entrapment syndrome occurring in the upper body or arm. Increased compression or pressure on the ulnar nerve in the elbow gives rise to this condition. Along with discomfort, this pathology may lead to the loss of hand functioning. 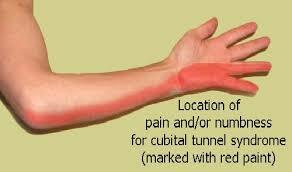 What do you understand by Cubital Tunnel Syndrome? Ulnar nerve is a crucial nerve running through your arm and is responsible for sensation and movement of the forearm and hand as well. This Ulnar nerve passes through a tunnel of soft tissues named as ‘cubital tunnel’ that runs under a bony bump at the inner side of your elbow. The syndrome is called ‘cubital tunnel syndrome’ as it results due to the entrapment or irritation of nerve within the confines of cubital tunnel. This condition affects more men than women and the athletic performance of the athletes who are engaged in sports requiring strong hand or wrist movements. The entrapment causes tingling, numbness and pain along the inside of your arm down the ring and little finger. A direct blow to the inside of the elbow as in the case of sports like; baseball, tennis, rugby, football etc. What are the treatment options suggested to treat Cubital Tunnel Syndrome? Contact Alliance Physical Therapy for the state of the art treatment of any of your musculoskeletal injury or problem. Our certified therapists use patient proven methods and develop customize treatment plans according to your needs and urgencies. Auto-Accidents are said to happen every 5 seconds in the United States and these figures continue to rise. Victims of auto-accidents usually suffer from skeletal, muscular, neurological and soft-tissue injuries which are not detectable initially as they do not cause much pain. So the victims ignore them and do not seek professional treatment. This causes the biggest blunder. With auto-accident injuries, immediate and specialized treatment is needed to avoid developing long term discomfort and chronic pain. A pro-active Physical Therapy treatment and Rehabilitation plan can save the victims from surgical interventions and long term reliance on medications as well. Physical Therapy modalities while conditioning your muscles and bones also help to alleviate pain and relieve the debilitating effects of auto-accident injuries. Vehicular injuries often develop the symptoms like; back pain, whiplash, fatigue, headache, muscle-spasms, nausea, neck pain, tendinitis, shoulder pain, problems with vision, dizziness etc. Physical Therapists are experts at diagnosing, evaluating and treating these injuries. They re-align your vertebrae and help to restore your lost structural balance and treat soft tissue injuries with customized rehabilitation program. Hands-On Therapy and therapeutic equipments are used for the vestibulo-ocular rehabilitation of the victims. Corrective exercises are used to stretch and strengthen the damaged muscles. Therapeutic exercises targeting and strengthening the joints are suggested. So if you have been a victim of vehicular accident and sustained a musculoskeletal injury and want to get relief without pain-killers and surgical interventions, then Physical Therapy is the most influential treatment available. Contact Alliance Physical Therapy for the skilled and prompt treatment of auto-accident injuries. Our board certified therapists are specialized in diagnosing, treating and managing auto-accident whiplash injuries and have helped numerous patients to recover successfully from whiplash. What do we mean by Becker Muscular Dystrophy? Muscular Dystrophy belongs to that group of genetic degenerative disorders which involve progressive weakness and wasting of voluntary muscles of the body. This condition is named after the German doctor Peter Emil Becker who first described the disorder. Becker Muscular Dystrophy (BMD) is among those common nine kinds of dystrophies; which are characterized by the slow weakness and wasting of skeletal muscles that are used for movement and heart muscles as well. Such dystrophies are common among the men than women. Being a genetic disorder; your family history of disease increases your risk of getting affected. Despite of being more common in men than women; males usually inherit it from their mothers, i.e. females are the carriers of this disease but they usually do not exhibit any symptoms. How is the Becker Muscular Dystrophy an inherited disease? When a particular flawed gene or mutation of a particular gene on the X-chromosome makes its associated protein (named as dystrophin) partially functional, this results in the Becker Muscular Dystrophy. That is the reason that Becker Muscular Disease is also known as ‘X-linked recessive genetic defect’ i.e. it is inherited due to a defective gene on the X-chromosome. Males manifest the symptoms of this disease because they have only one X- chromosome. While the females have two X- chromosomes, so they usually do not show any signs or symptoms as the healthier X- chromosome compensate for the defective one. What are the signs and symptoms of Becker Muscular Disease? What are the treatment options suggested to treat Becker Muscular Dystrophy? • Physical therapy is suggested to encourage the activity as the inactivity (like bed rest) can further worsen the condition. Muscle strengthening exercises are suggested to maintain muscle strength. • Massage, Compression treatment and night Splints may be advised to treat muscle cramps. • Use of assistive devices like; knee, leg or back braces are suggested to keep the muscles flexible. • Occupational Therapy is advised; where patients are helped and taught to use orthopedic appliances like; wheel chairs and other assistive devices as well to improve movement and training for doing the daily tasks in new ways is also provided. Contact Alliance Physical Therapy for the adequate and enhanced treatment of any of your neuromuscular disorder. Our certified therapists develop customized treatment plans according to your needs and preferences and utilize patient proven treatment techniques to heighten the quality of your life.